Most of us don’t pay that much attention to our fingernail health. Oh, we’ll trim or file them to keep them looking neat, but that’s about it. But did you know that your fingernail health can actually tell you a lot about your overall health? If you see abnormalities in your fingernails – or your toenails, for that matter – that could be a sign something is wrong. These are just a few examples. Read on for tips on maintaining healthy nails, too. 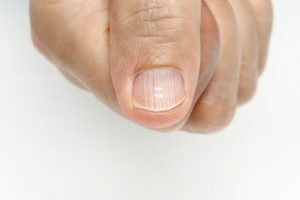 If you see horizontal indentations on your fingernails (also known as “Beau’s lines”), these fingernail ridges could be a sign that you have some sort of illness. You could have a fever, or even a problem with your vascular system. Now, the type of potential health problem associated with discolored nails depends on the type of discoloration. If you notice brown discoloration under a nail, especially a brown line that extends to your cuticle, that could be a warning sign of serious problems.3 Get to a dermatologist as soon as you can to get it checked out – even if you have otherwise healthy nails. If your fingernails appear curved, or the tips of your fingers look somewhat like a club, that could be a cause for concern. This shape can sometimes develop quickly – in as little as a few weeks – and it could be a sign that you don’t have enough oxygen in your blood. 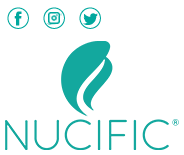 Many people associate white nails, or white spots on nails, with problems such as a zinc or calcium deficiency. But the truth is that if you have white nails, or white spots on your nails, you don’t have to worry. The chances are good you have healthy nails. Even if you don’t notice anything odd with your fingernails or toenails, you might want to know how to keep your nails looking their best. There are several things you can do to ensure your nail health. Here are just a few. → Don’t bite – If you want the best fingernail health possible, don’t bite them. More on how to keep from doing this in a bit. → Cut correctly – Always keep your clippers or nail scissors sharp. For optimum nail health and strength, round your nails a bit at the tip. → Keep ’em clean – One of the best things you can do for your fingernail health is to keep them as clean and dry as possible. → They’re not tools – Avoid using your fingernails to open soda cans, or to dig things out of tight spaces. → Don’t forget your toenails – When you cut your fingernails, remember to keep your toenails trimmed as well. 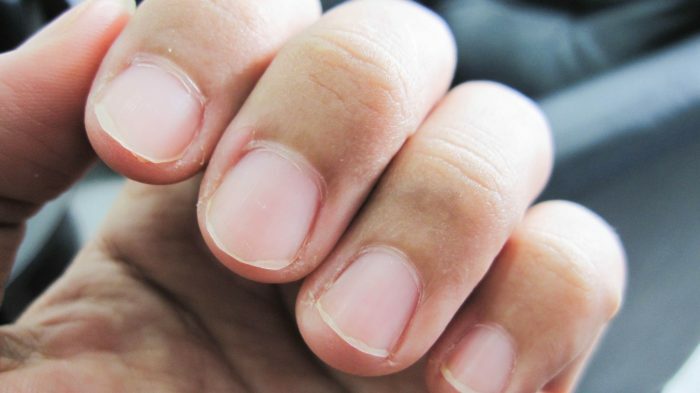 If you bite your nails, there are a few things you can try if you are looking to kick the habit and boost your fingernail health. As you can see, your fingernail health can paint a revealing picture when it comes to your overall health. If your fingernails or toenails look discolored, have strange lines, or look odd in any other way, you might want to see your doctor. And if it looks like your fingernail health is fine, you’ll want to take steps to keep it that way. Trim them on a regular basis and keep them clean. Even more importantly, don’t bite them. The steps you take to keep healthy nails will be worth it in the long run.